Again, A Time Machine is A Book Works tour­ing exhib­i­tion in five parts with con­tri­bu­tions by Jonath­an Monk, Slavs and Tatars, Dora Gar­cia and The Happy Hypo­crite. 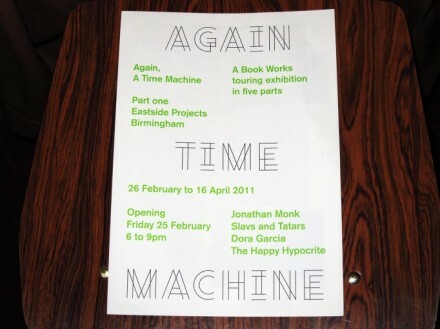 The first part will open on Feb­ru­ary 25th, 2011 at East­side Pro­jects in Birm­ing­ham. “Artists are play­ing with words again – raid­ing the archive, bring­ing the dead to life, mak­ing the liv­ing look dead. Quick­er than the ever-elu­sive present, they are for­ging a prac­tice through words, images, books, and eph­em­era, that begins to anti­cip­ate the past, fore­cast pos­sible his­tor­ies and re-vis­it altern­at­ive futures. ›Again, A Time Machine‹ is a flu­id tour, rein­vent­ing itself as work moves from ven­ue to ven­ue. Based on new com­mis­sions and archiv­al present­a­tions, it will gen­er­ate eph­em­era, per­form­ance and prin­ted mater­i­al, in response to a theme that plays with and inverts notions of time, archive, dis­tri­bu­tion and received pasts and per­fect futures. In the spir­it of ›Cur­at­ing the Lib­rary‹ (foun­ded by Mor­itz Küng at deSin­gel in 2003) Monk has been invited to select pub­lic­a­tions to become part of the East­side Pro­jects Lib­rary. Monk will dis­cuss how each title informs his prac­tice and his selec­tions will be on dis­play at East­side Pro­jects through­out ›Again, A Time Machine‹. Payam Shari­fi presents the work of the col­lect­ive Slavs and Tatars, in par­tic­u­lar the use and influ­ence of books and prin­ted mater­i­al in their prac­tice, with a par­tic­u­lar focus on the archive of Ira­ni­an and Pol­ish books used for ›Again, A Time Machine‹, in their install­a­tion ›Dear 1979, please meet 1989‹ (2011). Draw­ing on the meth­od­o­logy of one of the sec­tions from the Happy Hypo­crite, An End­less Sup­ply and Maria Fusco present a series of artists’ read­ings and spoken word per­form­ances. Dora Gar­cia and Gav­in Wade dis­cuss ›All the Stor­ies‹, and future col­lab­or­a­tions.